It would be an understatement to say that a great deal has changed for Hannah Miller over the last thirteen months. In that span, she has moved away from her family in Michigan to train under renowned coach Rafael Arutyunyan in Southern California, and has had to simultaneously balance dealing with the culture shock of living in a new city, adjustments of training in a new coach’s system and, now, with being on her own for the first time. In spite of all the changes that have been happening off the ice, perhaps the most complicated changes have taken place inside her new rink. At this time last season, Miller was preparing to make her ISU Grand Prix debut season at Cup of China and Rostelecom Cup. This year, however, she has yet to be assigned to any international events, a disappointment that she somewhat expected. Miller had an impressive showing at the U.S. Championships last season, placing 7th, which is her highest ever finish at Nationals at the senior level. Miller says she knows not to dwell on that success, but instead she uses it as motivation to keep improving. 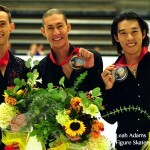 One of the biggest changes in moving to her new rink was having to adapt to sharing the ice with other top level international skaters, including 2016 World silver medalist Ashley Wagner, 2016 U.S. national champion Adam Rippon, and 2016 U.S. national bronze medalist Nathan Chen, as well as new addition Michal Brezina, the 2013 European bronze medalist and two-time Olympian (2010 and 2014), who represents the Czech Republic. This season, Miller will be keeping her “Arabesque” short program, as she hopes to further improve it with more devoted training time. Though her short program will be familiar, her free skate program is brand new and she will be debuting it at the Glacier Falls competition the last weekend in July. As with any elite athlete, Miller’s training schedule is packed every day with both on-ice and off-ice workouts, but it is also subject to alterations depending on her needs on a given day. 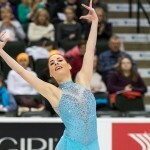 Not being forced to split her time between schoolwork and skating has also opened up her schedule and allowed for her to devote more time to her career. 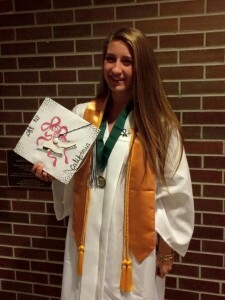 Miller graduated from Williamston High School in her hometown of Williamston, Michigan in June of 2015 . She was the valedictorian of her class with a 4.0 GPA. She is reveling in no longer having to put so much effort into maintaining her high grades. Despite not being enrolled in a traditional college or university, Miller is taking online classes part-time through Michigan State University. She is still unsure of what she would like to do after her skating career is over. Despite this uncertainty, she is very clear about her current goals in the sport, saying that her ultimate goals include making a World and Olympic team with her eyes set on the Winter Olympics in South Korea in 2018. However, even amidst the pressure of her training, Miller is still able to take part in activities off the ice. While remaining hopeful for an international assignment this fall, Hannah Miller clearly is focused on improving all aspects of her skating and embracing the new lifestyle that has come with adapting to a new city and training regimen. If she can conquer the real-life obstacles that come with any big changes in routine, it will be fascinating to see how her new technique and growing confidence will pay dividends on the ice.